If you ever get stuck with setting up Contentberg with your WordPress installation, you can get in touch with our friendly and dedicated support via our Support Forums. - WordPress v5.0 Final Complete Compatibility. - Fixed: Slider post count when set via a page. 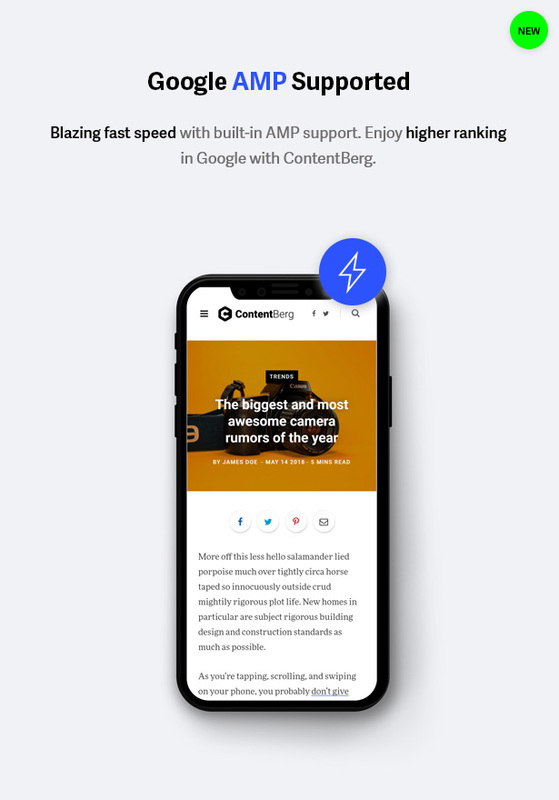 - Fixed: Gutenberg v4.5.1 conflict with AMP. - Fixed: Large dropcap in Edge browser. 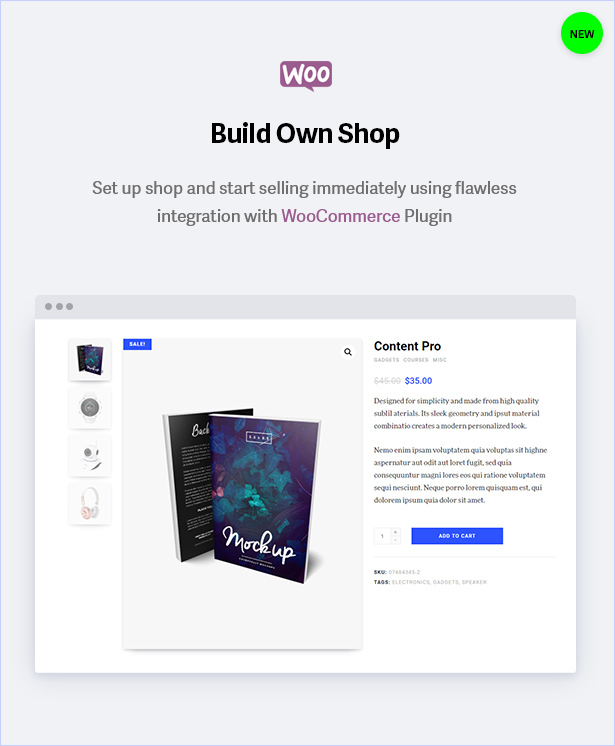 - Updated: WooCommerce template file for latest. - Added: Gutenberg v4.5 support and fixes. - Added: Styles for new pullquote style with background. - Improved: Search overlay on iPhone. - Improved: Customization such as colors apply in AMP now. 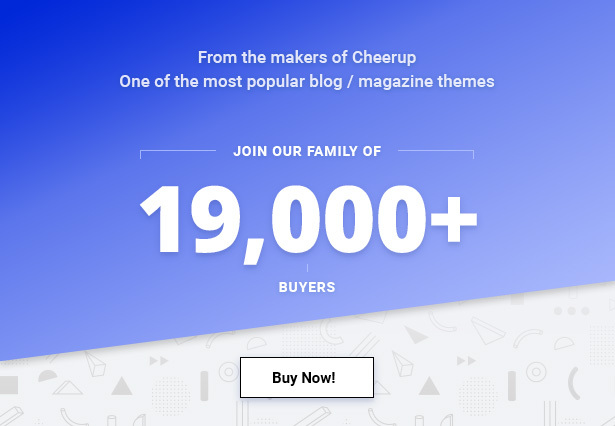 - Improved: Typography and color options for WooCommerce. - Improved: Jetpack subscribe boxes styling. - Fixed: Menu id for the topbar navigation. - Fixed: AMP logo distortion when mobile logo not uploaded. - Fixed: False positive AMP error notice in Gutenberg. - Fixed: Gutenberg v4.4 align full in backend. - Few new settings in customizer. - Gutenberg v4.1 compatibility fixes. - Added: Media & Text block styles. 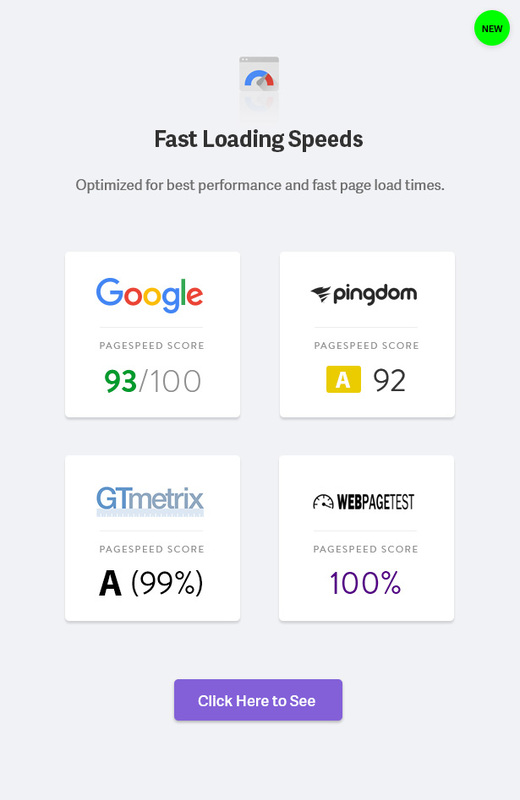 - Improved: Parallax performance on single. - Improved: Smart Sticky header triggers. - Improved: Post Nav + Social Sticky on smaller laptops. - Fixed: Centering for small images on spacious layout. 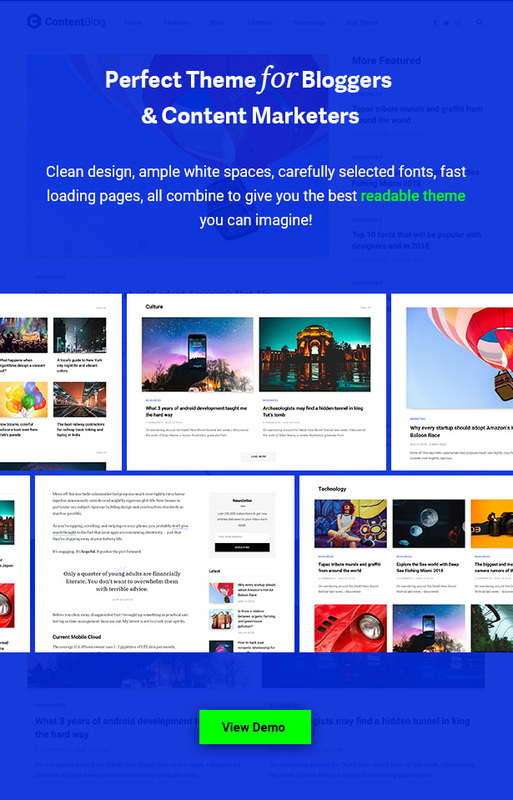 - Fixed: Backend Gutenberg styling for v4.1. - Fixed: Responsive columns for latest Gutenberg update. - WooCommerce Custom Styles and Compatibility added. 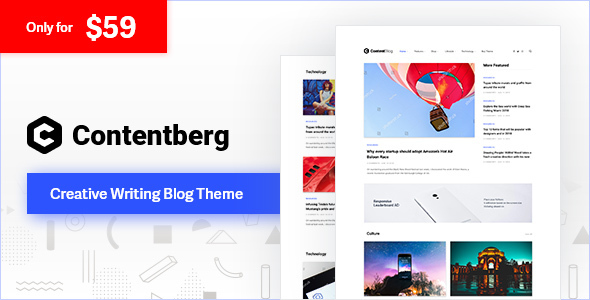 - Added: Gutenberg 4.0 fixes and compatibility. - Added: Alternate demos to importer. - Fixed: Widget slider hover text shadows. - Fixed: Search modal issue when lightbox disabled. - Updated: Bunyad AMP with reporting fixes. - Added: VKontakte option to social share float. - Added: VC text block option to use single fonts. - Added: Sample Child Theme in package. - Fixed: Header Style 2 ad code filtered by security. - Fixed: CSS cache race condition. - AMP Support Added with custom styles. 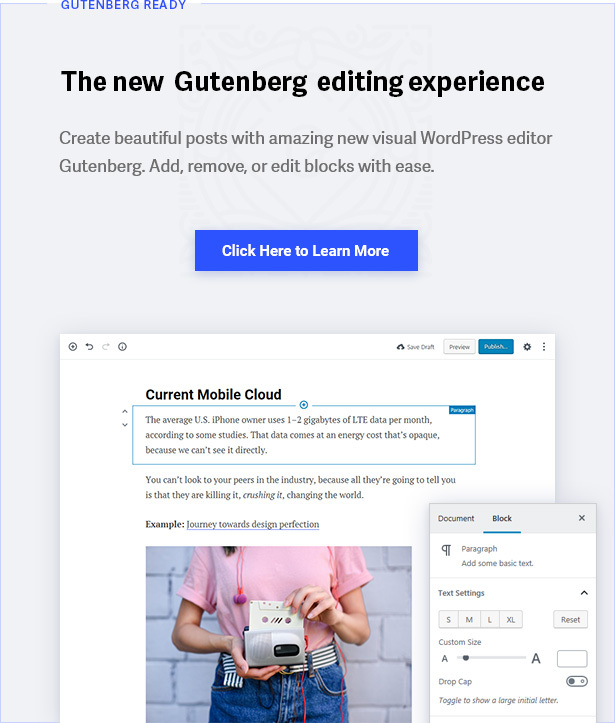 - Added: Gutenberg posts AMP support. - Added: More performance optimization features. - Added: LinkedIn, Google+ options for social share. - Improved: Mobile Menu design. - Improved: Classic editor left align on phones. - Improved: Performance guide in docs. - Improved: General > Other Settings section added. - Improved: Full content importer. - Fixed: Slider options settings for pages. - Fixed: Missing List home block in widgets. - Further improvements to mobile views. 5 average based on 25 ratings.